Today version 1.6.9 of the VOSviewer software developed at CWTS was released. 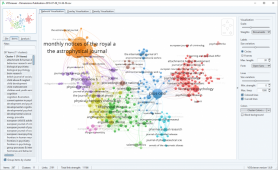 VOSviewer is a popular freely available software tool for visualizing bibliometric networks. In collaboration with the Dimensions team at Digital Science, CWTS researchers Nees Jan van Eck and Ludo Waltman have added support for Dimensions to VOSviewer. Dimensions data can be used to create visualizations of co-authorship, citation, and bibliographic coupling networks. No subscription is needed to download data from Dimensions. By adding Dimensions support to VOSviewer, the software now supports all major bibliometric data sources. In addition to Dimensions, support is provided for Web of Science, Scopus, PubMed, and Crossref. More information about the Dimensions support offered in the new release of VOSviewer can be found on the Dimensions website.